Urban fruit foragers and artist collective Fallen Fruit will unpeel the fun within America's favorite fruit. June 8, 2009, 1:39 p.m.
That exhibition’s the brainchild of the artist collective Fallen Fruit, a trio of urban fruit enthusiasts who merge fruit with community, environmentalism, art and activism. In Los Angeles, the fruit of trees that hang over public property is legally free game — and Fallen Fruit’s used this rule to organize everything from nocturnal fruit forages to fruit jams. This month, Fallen Fruit takes its inspiration from the collective’s recent trip to Colombia — where Chiquita paid off murderous paramilitary groups as part of its business practices — for its United Fruit exhibition at Los Angeles Contemporary Exhibitions (LACE). Everyone’s invited to the United Fruit opening, which will include a participatory performance called “Are You Happy To See Me?”: “Hundreds of bananas will be brought in for guests to eat and photograph themselves playing with this often comical or suggestive fruit.” The delicious games will be played on June 16 from 8 p.m. - 10 p.m. at LACE (Los Angeles Contemporary Exhibitions), 6522 Hollywood Blvd., Los Angeles. The exhibit runs June 17 to Sept. 27. 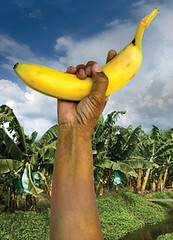 For more on the complex and scary past and future of bananas, read my review of Banana: The Fate of the Fruit that Changed the World by Dan Koeppel — and follow fair trade company Equal Exchange’s current series of blog posts on bananas.